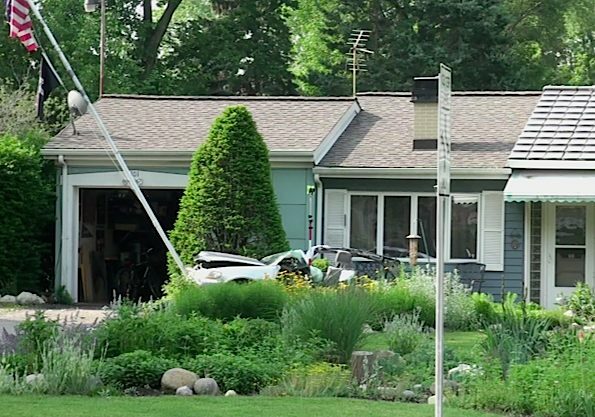 Mount Prospect police received a report about 8:20 a.m. Saturday that a 2002 silver Honda was reported stolen sometime overnight from a residential area near Kensington Road and Wheeling Road. No offender information was available during the report. A Mount Prospect police officer immediately compared the license plate information with a silver Honda involved in a fatal crash on Camp McDonald near Maple just after 3:00 a.m. Saturday, and identified the vehicle description as the same vehicle. Mount Prospect police are investigating. The 2002 Honda was apparently eastbound on Camp McDonald Road when it was driven off of the roadway and struck a tree at high speed, causing the Honda to split in half. The crash killed two females and one male. A second male was transported to Level I Trauma Center Advocate Lutheran General Hospital. Rear half of Honda that was split in half in fatal crash on Camp McDonald Road, just east of Elmhurst Road. Front half of Honda rests near flag pole flying United States of America flag and POW-MIA flag. Prospect Heights police and firefighter/paramedics responded just after 3:00 a.m. Saturday to a one-car crash with a tree. The car was split in half with at least two bodies ejected from the vehicle. Three people were already dead at the scene when police and firefighter/paramedics arrived at the crash scene on the south side of Camp McDonald Road, about 200 yards east of Elmhurst Road. The ages of the victims were reported to be between 14 and 19. 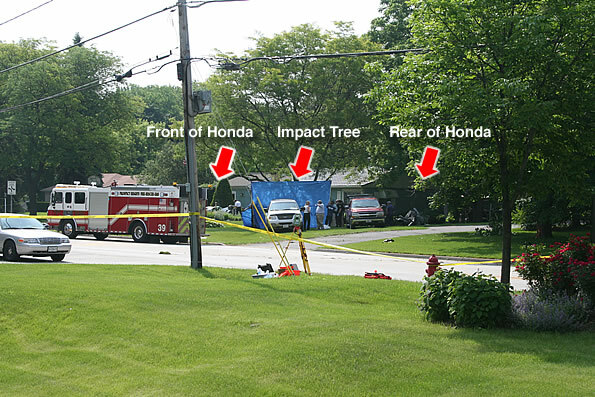 Fatal crash scene showing tree and location of the front and rear half of wrecked Honda.